Within the hip there are several small lubricated sacs that act as cushions. These are called bursae and they help reduce friction and pressure between bones, tendons and muscles moving across each other. When injury or overuse occurs to the hip one of these bursa can then become inflamed resulting in tremendous pain and discomfort… this condition is known as hip bursitis. Hip bursitis pain should not be left untreated as it may become chronic which could then lead to scar tissue formation and further irritation and pain. Tenderness and discomfort in the hip even at rest. Hip bursitis can occur on either side of the body and may present as either right hip pain or left hip pain depending on the location. In some situations the condition can exist bilaterally (both sides at the same time). Bilateral hip bursitis may be a sign of an autoimmune condition or due to a secondary injury after shifting ones body weight from the side which was initially affected to the other side (over compensating or guarding). How is Hip Bursitis Diagnosed? There are many different causes for hip pain that may require different treatments. In order to rule out or understand if there are other underlying causes to your hip pain it will be necessary to visit a qualified medical professional in order to get a proper diagnosis. As there is rarely any external visual swelling associated with bursitis in he hip it will be difficult to properly diagnose with just a visual and physical examination. If your doctor suspects that your pain is due to bursitis in the hip then they will likely require an x-ray and ultrasound to properly confirm the diagnosis. Your doctor may feel that is prudent to also order blood tests or/and an MRI if they suspect any co-existing condition or other possible causes. 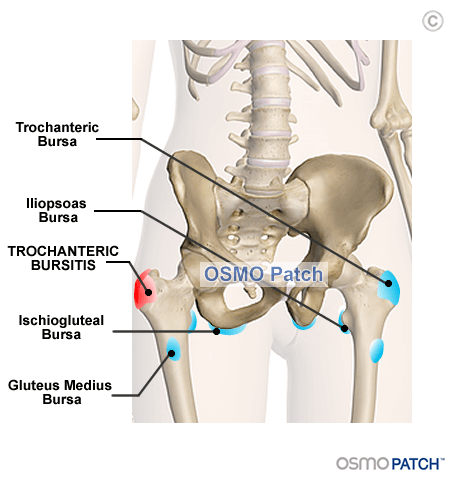 Are there any exercises for hip bursitis that I should or shouldn’t be doing? Should I be applying ice or heat for hip bursitis pain? What are the Current treatment options for hip bursitis? Are there any Natural Treatments for hip bursitis?